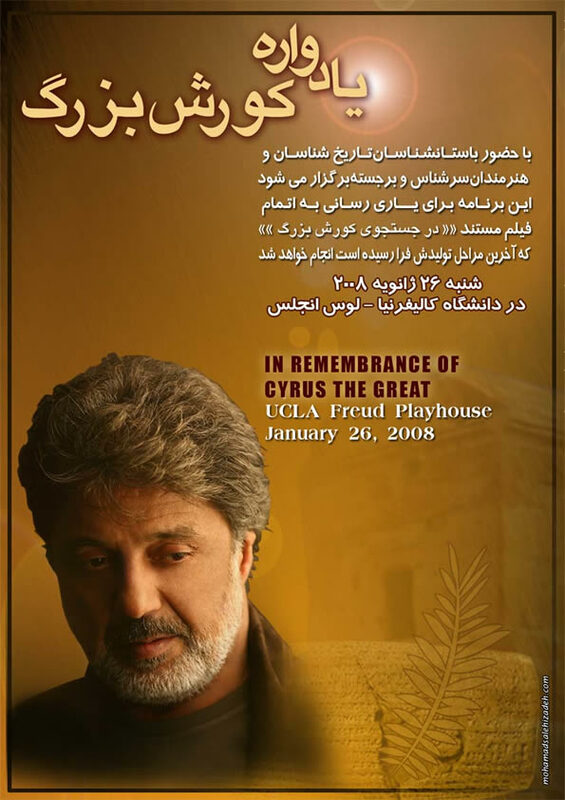 Come join us along with the world's most renowned scholars and top performing artists in remembering the life of Cyrus the Great on January 26, 2008 at UCLA. 'In Search of Cyrus the Great' is a factually-based documentary film in need of your help and participation. Must Watch VOA interviewed Nazanin Afshin-Jam about child executions and other human rights violations in Iran. Her Majesty Queen Farah Pahlavi at the Th�atre des Champs-Elys�es "Ciro in Babilonia" de Gioachino Rossini. Cyrus � Babylone est le premier grand ouvrage lyrique du c�l�bre compositeur italien Gioachino Rossini. Il n'avait que 20 ans lorsqu'il le composa pour le voyage officiel de Napol�on Bonaparte � Florence, en 1812. C'est la Grande-Duchesse de Florence, qui voyait en Bonaparte un digne repr�sentant de la R�volution fran�aise et de sa proclamation des droits de l'homme, qui lui en avait pass� commande. Napol�on Bonaparte n'�tait-il pas le nouveau Cyrus, ce grand lib�rateur de l'ancien monde, comme le montrent les textes sacr�s de la Bible o� il est appel� "le Messie" de Dieu ? L'histoire telle que nous la relate la Bible se passe � Babylone, une nuit de l'an 539 av. J-C pendant le grand festin de Balthasar, puissant roi de ce royaume, en pr�sence des dignitaires du pays. Soudain, une main invisible �crit des mots myst�rieux sur le mur de la salle. A la demande du roi, on envoie chercher dans sa prison Daniel, Proph�te d'Isra�l, pour les d�chiffrer. Ils r�v�lent que les jours de Balthasar sont compt�s : il p�rira lors de la prise de Babylone par Cyrus, roi de Perse, qui lib�rera les captifs. Comme dans la plupart des op�ras, l'histoire sert ici de toile de fond � une intrigue imaginaire o� l'on retrouve tous les grands th�mes intemporels : l'amour, la bravoure, la trahison, la l�chet�, port�s par la musique sublime de Rossini qui en r�utilisera quelques mesures dans des ouvrages post�rieurs, dans le Barbier de S�ville par exemple. 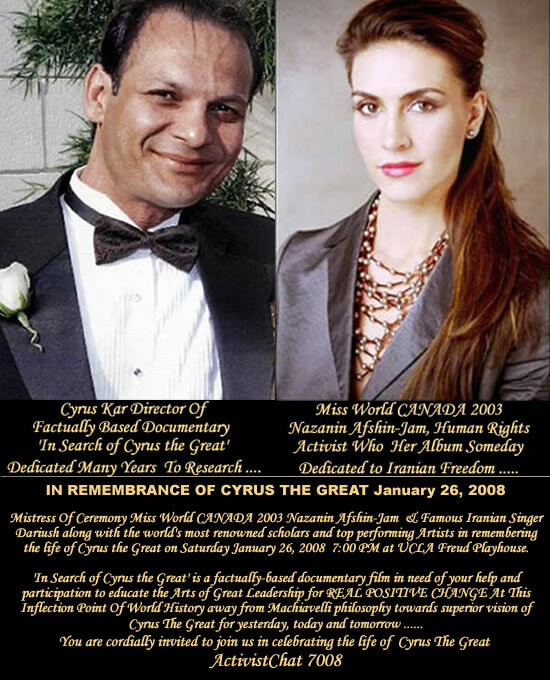 ActivistChat congratulates film maker Mr. Cyrus Kar , Dariush, Miss World Canada 2003 Nazanin Afshin-Jam, Sussan Deyhim, Anna Djanbazian, Max Amini, scholars and speakers who delivered an excellent successful program IN REMEMBRANCE OF CYRUS THE GREAT, At UCLA on Saturday January 26 2008 . The active participation and contributions in big number was far above ActivistChat expectations and is considered as good success story for all participants and recognition for Mr. Cyrus Kar many years of hard work , accepting many risks towards very noble cause for creating factually-base documentary film �In Search Of Cyrus The Great� with very limited resources. ActivistChat is appreciating the superb teamwork by many individuals, groups specially is recognizing Ms. Shookoh Mirzadegi and savepasargad.com art team for event promotional advertisement painting, Dr. Iman Foroutan TV interview with Cyrus Kar, many Internet sites, and Bloggers contributions for promoting this great event. This is definitely showed our strong unity in spirit of Cyrus The Great and getting stronger every day. The Google Search For �IN REMEMBRANCE OF CYRUS THE GREAT� shows the extent of support for this event and validates our claim for strong unity for better future. Thank you for excellent teamwork. It happened here, on January 26, 2008 at the UCLA Freud PlayHouse, in Los Angeles, California. It brought the world's most renowned scholars and top performing artists to a remembrance of the life of Cyrus the Great, the founding father of Persia and the mighty Persian Empire� perhaps the most exemplary, magnificent and just king the world has ever known. This event put together visual arts, the ambience of the theater, the inspirational young and beautiful Anna Djanbazian�s dancers who, in precise rows executed, perfectly harmonious and breathtaking dances. The entertainment continued with delightful music by the legendary Iranian pop singer, Dariush, who selflessly and quickly accepted the offer to perform without any compensation for this noble cause. And, the same goes for the always magnificent, Oscar-Nominated composer, vocalist and performance artist, the beautiful Sussan Deyhim. The evening evolved and cultivated by an impresario of Persian archeology, the adventurous, the explorer, the film maker of our ancient past and simply an Iranian hero, Cyrus Kar himself, daring to lure and was captivate the audience for a mystical night of remembering Cyrus the Great. The Iranian communities around the world are grateful and appreciative when singers, dancers, performers and artists are willing to set aside their time and perform freely to promote justice and freedom. This would indeed register them forever and ever not only as who they are, but as what they did for a noble cause. We hope to see more and more Iranian artists participating in this kind of gathering. �An artist is not paid for his labor but for his vision.� said, James MacNeill Whistler. It all began like a lyrical poem, evolving into the contemplative national epic. In the ancient tradition of historical epics, all the elements were perfectly matched to the image of the inspirational melody. The opening ceremony started with the Mistress of Ceremonies, Nazanin Afshin-Jam, the charming and beautiful, singer, songwriter and International Human Rights Activist. She was also Miss World Canada. Beyond a doubt her presence gave euphoria and excitment to the entire ceremony. And finally, the very gracious audience came from near and far to gather to do what every Iranian understands; the recognition and perseverance of our national heritage from the ravages of time and calamities of the present ruling regime in Iran. They came to support their fellow Iranian, Cyrus Kar, who has been, painstakingly, trying to make a documentary film about the life of the benevolent king, Cyrus the Great. There were many distinguished and honorable speakers who contributed to this event. The first was Dr. David Stronach, the renowned Scottish archaeologist of ancient Iran and Iraq. He is currently a professor at the University of California, Berkeley. Also speaking were Dr. Jennifer Rose, Professor at Stanford University, Dr. Abbas Milani, an Iranian-American historian and author, Professor Mark D. Rosenbaum, legal director of the American Civil Liberties Union in Los Angeles, where he has worked since 1974. Notwithstandingly, what the Islamic Republic despotic rulers have set out to do is defeat the Iranian spirit inside Iran and extinguish Cyrus� spirit around the world through brainwashing, coercion, and terrorist acts. It has given Cyrus Kar all the more impetus to re-create and show the world who and what Cyrus the Great truly was, the embodiment of the human spirit. This documentary is in its final stages and is in dire need of your support. It is ironic that a man whom the Jews called Messiah and died 2500 years ago can be a threat to the very existence of this brutal, un-Iranian current Islamic regime. The Islamic Republic of Iran seems to be fearful both of the dead and the living. Yet, Iran has survived despite her enemies, the course of innumerable wars, invasions, pillages and captivity at the hands of barbaric tribes and being forced into an un-Iranian religion. Our message to the world is clear. We, the diverse people of Iran are descendants of an optimistic, enlightened, and positive people. We �are� the children of Cyrus the Great. We meet any challenge and pay any price to defeat tyranny and we will not rest until Iran is completely free of the despotic rule of Islamofascism. I am tinkering with some basic concepts of a civil society. The pure mentioning of old glory can be self - flattering. It is remaining almost a fluke, to get a leadership which pursues the civil society. Historically, there were short periods of a rule of the civil society, and soon they were replaced by violence. In case of the Persian nation, it would be a a giant enterprise to bring together the best sons of the nation, to create a civil society from the ruins of previous existences. The violated nation is bleeding, and its own sons are sometimes the causes of the wounds. Thanks for sharing this. It was my 11th birthday when my bedridden father --his body and mind being ravaged by terminal cancer-- gave me a most treasured gift that 20 years later I passed onto one of my children: a leather bound copy of Herodotus' Nine Books of History (aka The Histories). It was Herodotus who introduced me to Cyrus the Great and drove admire the greatness of the quondam Persian Empire. Congratulations to film-maker Mr. Cyrus Kar who has been chosen by The International Committee to Save Pasargad as Man of The Year for the first documentary on the life and works of Cyrus the Great. Cyrus Kar, the Iranian Man of the Year Talks to Sohrab Akhavan-F Farsi version: The International Committee to Save Pasargad chose Mr. Cyrus Kar, the director of the first documentary on the life and works of Cyrus the Great as the 7008 Man of the Year. Here, in this short video, he talks about his work to Sohrab Akhavan, the Iranian TV presenter and filmmaker in Farsi. Thank you for what you do. I read your articles all the time. It must be very depressing seeing your country being steadily destroyed by a set of mental Zombies wearing ball gowns and party hats. I feel exactly the same, but perhaps not to the same degree, with the politicians of my country England. They are also brain dead, they are dragging my beloved country into a state of dimitude with there mindless PC appeasement attitude. I am getting old and the fire in my belly has almost gone out, but it doesn't stop me getting angry. The problem is that we are on the way towards a great world war, it wont come next week, but it wont be long. The world political scene is showing the same symptoms as it did between 1935-39, appeasement, lying to itself and finding excuses to justify their appeasement, a delusional U.N. In many ways the League of Nations was worse. Now we have the crowing of the Islamic fascists with there modern version of ein Reich ein Volk ein Fuhrer, one Califate one Ummah, one prophet, are they any different to the Nazis? Then we had the rantings of Hitler and Mussolini and the lying propaganda of Goebbels. Now we have the rantings of Amajinadad and the shrill screaming of the Mullahs, interpreting the word of the prophet ( Islamic propaganda). The problem is that we have no leaders who understand the problem, no historians to lead us. If you read about Churchill you will find that he wrote 40 books most of them histories, Roosevelt if my memory does not delude me had also a classical education. Without a past we have no future, they understood this, the leaders of today do not. I do not think you have come to this conclusion logically, but in reading your work you have certainly come to it intuitively. Whether you are aware of it, I don't know, by the way I enjoyed your writing about Cyrus and the attempt to destroy his tomb. Without history we are doomed. According to the World Encyclopedia, cultural genocide is a term used to describe the deliberate destruction of the cultural heritage of a people or nation for political or military reasons. Since coming to power twenty-nine years ago, the Islamic Republic of Iran has been in a constant battle with the Iranian people as well as her culture and heritage. The upcoming observance of The Iranian Cultural & Natural Heritage Year in the spring of 2008 is not just an Iranian event; it is humanity's most precious heritage event -- your and your descendents' heritage. It is an event of great value which is in dire need of your support. Generations of humanity will bemoan the loss of this living testimony to the nobility of mankind. The destructive hand of any kind of zealots must be stayed. Stand up, raise your voice and do what is in your power to preserve what is rightfully yours. In a recent article, titled �UN Treasure Honors Persian Despot,� Spiegel Magazine criticizes the United Nations for recognizing an ancient artifact believed by many to be the world�s first declaration of human rights. The �Persian Despot� of course is Cyrus The Great, the author of the doctrine inscribed on the outer surface of a clay cylinder housed at the British Museum in London where it�s simply known as the Cyrus Cylinder. When this cylinder was discovered in 1879, amid the ruins of Babylon, it made huge headlines in the Christian West. It was the first time a biblical story had been confirmed through archaeology. But the euphoria quickly wore off. The democratic age had no room for a celebrated monarch. Before the age of democracy, most of the world had been ruled by monarchs. Since good monarchs were few and far between, the West had long considered Cyrus the epitome of what a good king should be based largely on the accounts of the Old Testament but also on a book titled �The Cyropaedia,� which literally means the Teaching of Cyrus, written by the 4th century BCE Greek author Xenophon. By 1960 the lines between history and politics had been blurred, which is why the pursuit of historical accuracy is such a noble and worthy cause. But there�s little historical accuracy to be found in Spiegel�s article. The shear number of mistakes, assumptions and half truths leave one wondering whether any attempt at objective reporting was made. Mr. Schultz, on the other hand, accuses Cyrus of �deporting� urban elites. The falsehoods in this article are so numerous that citing the evidence seems useless. But then, Mr. Schulz isn�t really interested in the facts. He and his motley crew of �experts� have dismissed all these sources as �propaganda.� So what is the basis for his theory? The answer lies in a single verse of the Nabonidus Chronicle. Cyrus did not �slaughter the people,� he �defeated the soldiers.� Two words can change history, which is why it�s so incumbent on Spiegel to get the facts straight before setting out to revise it. This revelation leaves Mr. Schulz�s article with nothing but speculation and conjecture. Mr. Schulz may see himself as an iconoclast out to �debunk� a long-standing tradition. But it is, in fact, Mr. Schultz�s position that is clich�. Persia�s role as an evil villain is such an integral part of Western folklore that only a handful of scholars such as Tom Holland have dared step out of the Euro-centric box to side with the evidence. Whether such tolerance was intended to prevent revolts or whether it was part of their Zoroastrian culture is a matter of debate. But there is no debate about whether such freedoms existed. These rights were first laid out by Persia�s patriarch, Cyrus The Great, and the clay cylinder, which Mr. Schulz calls �a hoax,� is a rare snapshot of Cyrus bestowing these very rights on the people of Babylon after conquering it in 539 BCE. Among those who were relieved from their exhaustion and servitude were over 100,000 Jews who chronicled the events that led to their captivity in the Old Testament. They describe a horrifying scene of destruction, murder and torture carried out by the infamous Babylonian king, Nebuchadnezzar, on the Jewish people and their capital city, Jerusalem. Here we have two completely independent sources corroborating each other. Is this all propaganda? No previous victor seems to have found it necessary to ingratiate himself to his vanquished subjects. In fact, reigning through terror sustained the Assyrian empire for over half a millennium. Sustaining his empire through a strategy of peace and tolerance was an enormous risk to Cyrus. Mr. Schulz considers those who appreciate Cyrus�s impact on world history as belonging to �the Cyrus cult.� But this cult boasts an impressive roster. Some of history�s greatest leaders, from Julius Caesar to Thomas Jefferson, studied Cyrus. In fact the Western concept of �the separation of church and state� may well have been influenced by Cyrus. Cyrus influenced heads of state as recently as 1948 when President Harry Truman based his decision to support the state of Israel in large part on his emulation of Cyrus. When introduced once as �the man who helped create the state of Israel,� Truman is said to have quipped, �What do you mean �helped create�? I am Cyrus! I am Cyrus! Mr. Schulz�s article closes with the following proverb: �A fool may throw a stone into a well which a hundred wise men cannot pull out.� It seems that the only one throwing stones, is Mr. Schulz. همراه و همصدا با هم میهنان عزیزم، سال روز صـدور نخستین منشور آزادی انسان ها را بزرگ می دارم. امیدوارم که یادآوری و بزرگداشت این رویداد تاریخی افتخار همۀ فرزندان ایران را به هویت تاریخی و درخشانشان دو چندان سازد و همبستگی آنان در راه نیل به آزادی و نیک بختی را جانی تازه بخشد. بیست و پنج قرن پیش، در دورانی که واژه های آزادی و حق بر مردم جهان ناشناخته بود، کورش بزرگ، پادشاه دادگر ایران، از آزادی و حیثیت انسان سخن گفت. او همگان را فراخواند که به یکی از آزادی های بنیادی بشری، که همانا آزادی پرستش و انتخاب مذهب باشد، احترام گذارند و با پیـروان هیچ کیشی به دشمنی برنخیزند و برعکس با آنان با احترام و مدارا رفتار کنند. چنین توشه های ارزنده و میراث های گران قدر فرهنگی است که شالوده های هویت ملی و ایرانی مردم شریف و صلح جوی ایران را مایه و ملاطی جاودانه بخشیده. امروز با بزرگداشت و تکیۀ هرچه بیشتر بر چنین میراث هـا و ارزش هایی است که می توان پیکــار بــا دشمنـان حقوق و آزادی های مردم ایران را نیرویی بی کران بخشید. با الهام گرفتن از همۀ بزرگان و آزادی خواهان نامدار تاریخ ایران واز قهرمانان مترقی انقلاب مشروطه است که می توان سرانجام غاصبان حقوق مردم ایران و دشمنان آزادی و پیشرفت و نیک بختی آنان را به عقب راند و بار دیگر نام ایران را به فهرست جوامع آزاد و آباد جهان افزود. یقین دارم که چنین خواهد شد.